How Do I Remove Grass Stains? 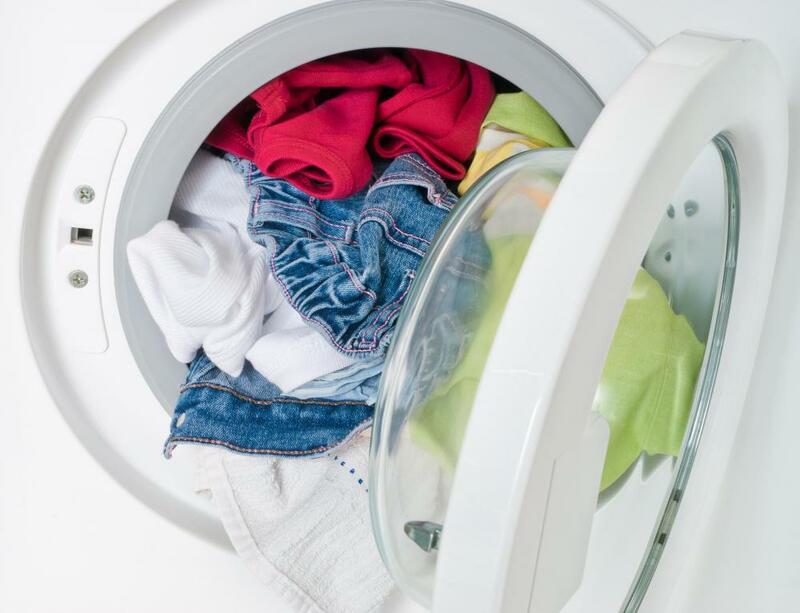 Be sure grass stains are completely gone before putting the clothing in the dryer. 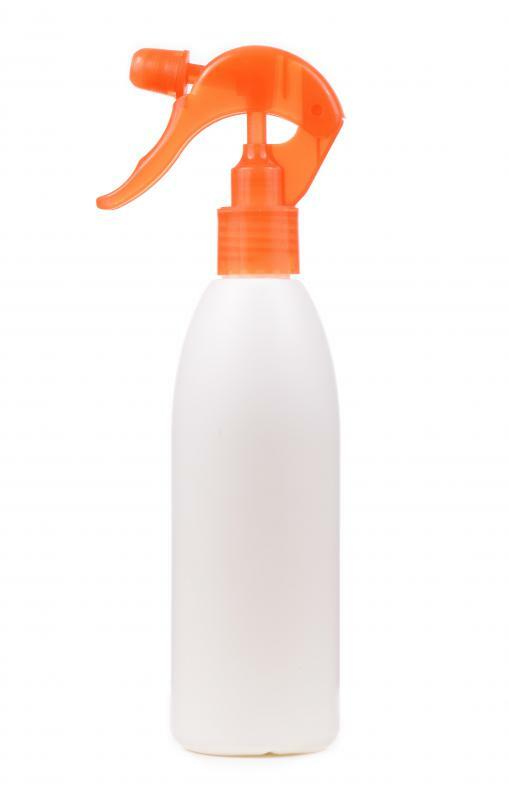 Detergent may be mixed with water in a spray bottle to help remove grass stains. Grass stains are notorious for being difficult to remove, whether the stain is on an article of clothing or your carpet. For grass stains on washable fabric, pre-treat the area with a laundry treatment, working it into the fabric with your fingernail or a scrub brush. Let it sit for 15 minutes to an hour and then wash it according to the care directions on the tag. While the garment is still wet, check the stain to make sure that it is completely removed before you place it in the dryer or hang it up to dry. If you need to remove grass stains from a piece of clothing that cannot be washed, a trip to your local dry cleaner is usually the best option, although an at-home kit may work. If you or a member of your family has inadvertently gotten grass stains on an article of clothing that is washable, the best way to get rid of it is to treat it immediately with a laundry stain treatment. Thoroughly saturate the area and use your fingernail or a small cleaning brush to work the stain treatment into the fabric, being careful not to scrub too far outside of the stain mark, as this can cause it to spread. If you do not have a stain treatment on hand, you can thin out your regular detergent with water, then place it in a spray bottle, and use it to remove the grass stains. Once the stain is nearly invisible, spray it lightly again with the treatment and let it sit for 15 minutes to an hour prior to washing it. Generally, the tougher the grass stain is, the longer you want to let it sit. After the garment has sat, put your washing machine on the pre-soak option and then wash the clothing per the directions on the tag. Soaking the garment will help to lift any remnants from the stain. One of the biggest mistakes that people make when trying to remove grass stains is not checking the clothing before they put it in the dryer. Making sure that the stain is completely gone when the fabric is still wet from the washing machine is important, as drying the clothing with the stain still there will typically cause it to set completely, making it nearly impossible to remove. If the stain is still in place after the first round of washing, treat it again with a laundry treatment and then rewash it. After the stain is completely gone, you can either line dry it or dry it in your dryer, depending on the care directions for the clothing. When it comes to dry-clean only clothing and grass stains, it is best not to attempt to remove the stain on your own unless absolutely necessary. As soon as you notice the mark, take the garment to your local dry cleaner and have the stained removed. Generally, dry cleaners have access to stain treatments that you would probably have a difficult time finding. If this is not possible, you can purchase an at-home dry cleaning kit and use the stain treatment provided. In the event that you choose this option, make sure that you read the directions carefully before treating your clothing for grass stains. What is Homemade Stain Remover? What is a Clothes Stain Remover? How do I Choose the Best Stain Remover? What are the Different Methods of Stain Removal? How do I Choose the Best Fabric Stain Remover? Can I Machine Wash "Dry Clean Only" Clothing?